The NT has been fortunate to host some of the finest artists (Westal), cartographers (Flinders & Roe) and photographers, going back to Hamilton & Hake at Escape Cliffs in 1866. 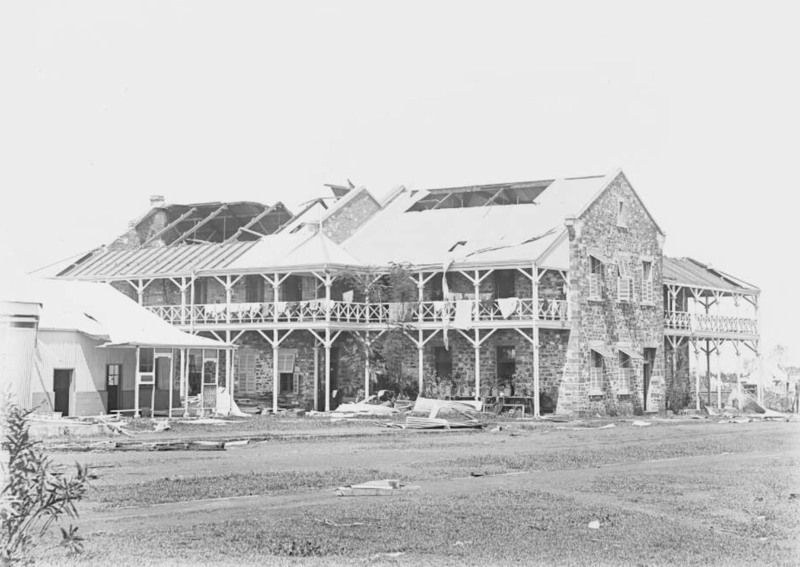 It was the immediate precursor to settlement at Port Darwin which has been photographed throughout it's entire history. ​The names of Captain Sweet and Inspector Paul Foelsche are paramount but a tendency to allot any early image to these two has diminished other valuable contributions from such as Florenz Bleeser. In the interim many Sweet & Foelsche images are presented on the Beagle Cove page. Florenz August Karl Bleeser (1871 - 1942) ​worked at the Telegraph Office. 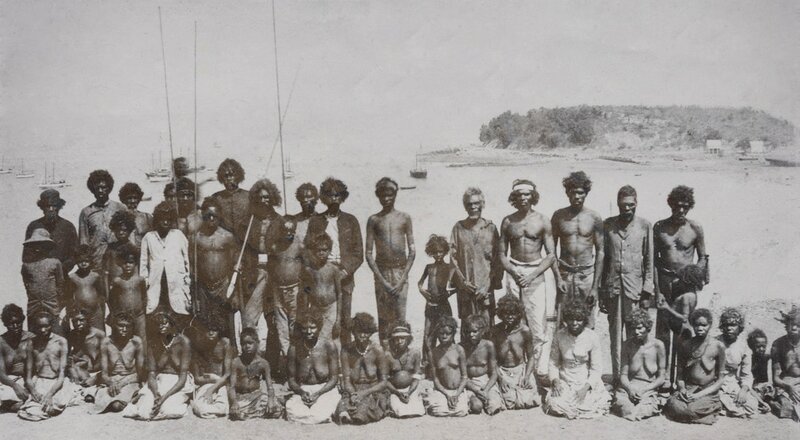 He was a celebrated botanist and as a photographer he had a range of interests including ships & young Larrakia women. He captured some of the most insightful images of Darwin around the turn of the 20th century. He is best known for his graphic record of the 1897 cyclone. Born at Woodside, in the Adelaide Hills, S.A., on 5 July 1871 and died at Malvern, Adelaide on 1 November 1942. Appointed to the staff of the Australian Post Office on 1 September 1884; in 1889 he was promoted and transferred to Darwin where he was later Assistant Postmaster. 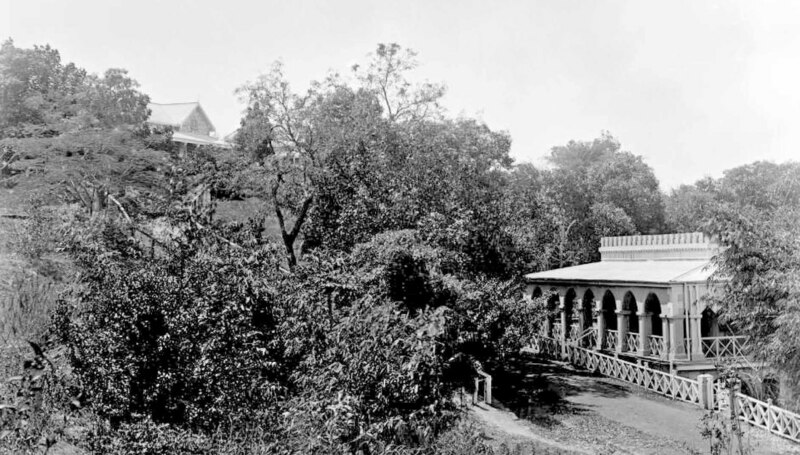 For the rest of his working life, he remained in Darwin and besides making valuable plant collections, he and his wife also entertained and assisted visiting scientists. After the first air raid on Darwin in February 1942 he and his wife were evacuated to Adelaide. Possibly influenced by his father who, as a very young man, is reported to have accompanied the botanist Dr R. M. Schomburgk on journeys in British Guiana 1840-44, Bleeser began making botanical collections soon after being posted to Darwin. He sent plant material to Kew, the National Herbarium in Melbourne, the Berlin Herbarium and some specimens to Blakely, in Sydney. Unfortunately, the material sent to Berlin has been reported to have been destroyed, whilst all his natural history collections and the bush-house of orchids which he had to leave behind in Darwin were also destroyed by looters. ​One writer expressed the opinion that Bleeser would have made his greatest contribution in a science laboratory, since he had added more than any other man (at that time) to the natural history around Darwin. Apart from the eucalypt (E. bleeseri Blakely (1927) ), Bleeser was commemorated by at least one orchid and two grasses being named after him. ​In 1927 Otto Schwarz described 43 new taxa from his specimens from the Darwin area. Specimens (numbered) at K, MEL (donation rec. 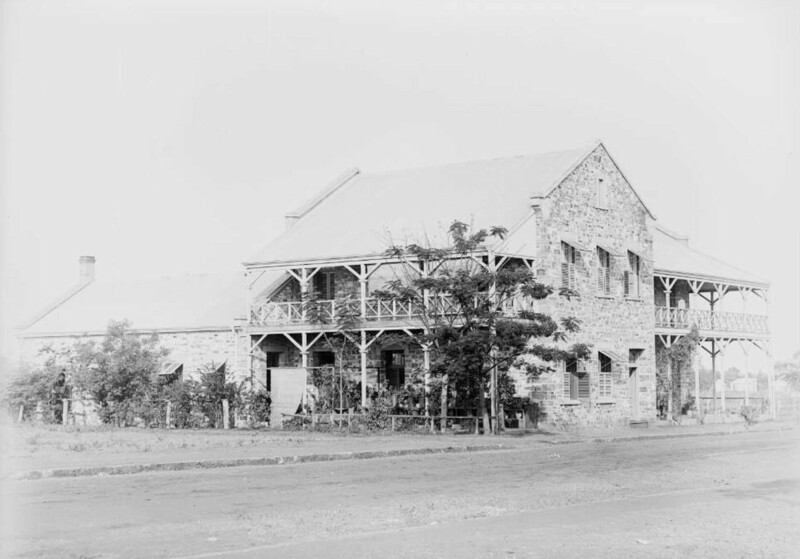 1928-29), NSW (and B but probably destroyed there in 1943); his private collection in Darwin also destroyed after he left. 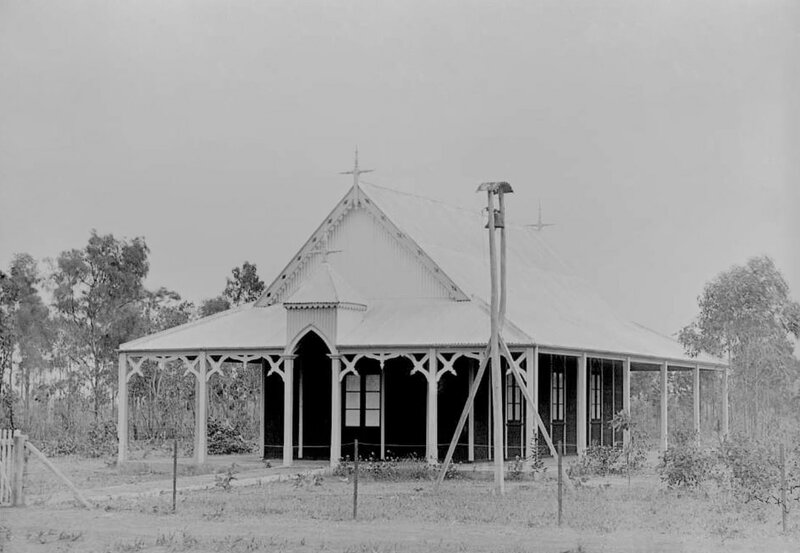 'Berrimah fell within the Hundred of Bagot, County of Palmerston. 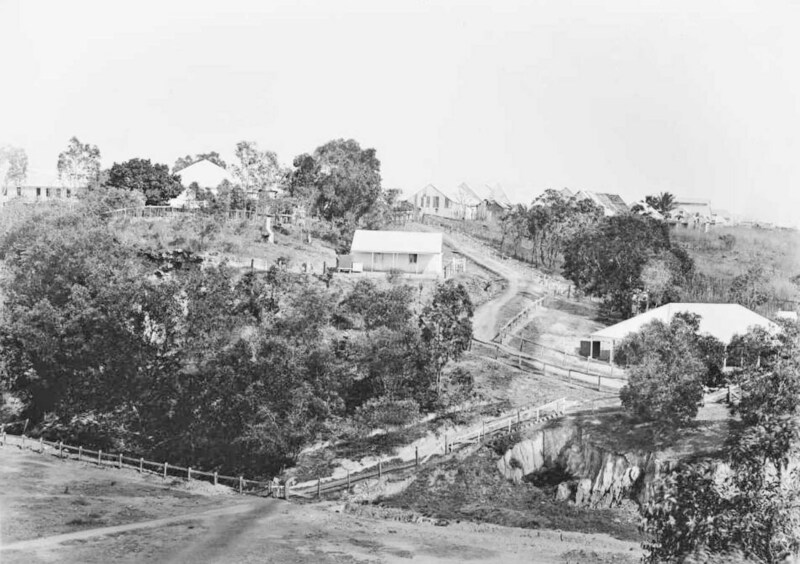 The area now occupied by Berrimah Farm was divided, in the original survey, into three Sections: 45, 390 and 391. 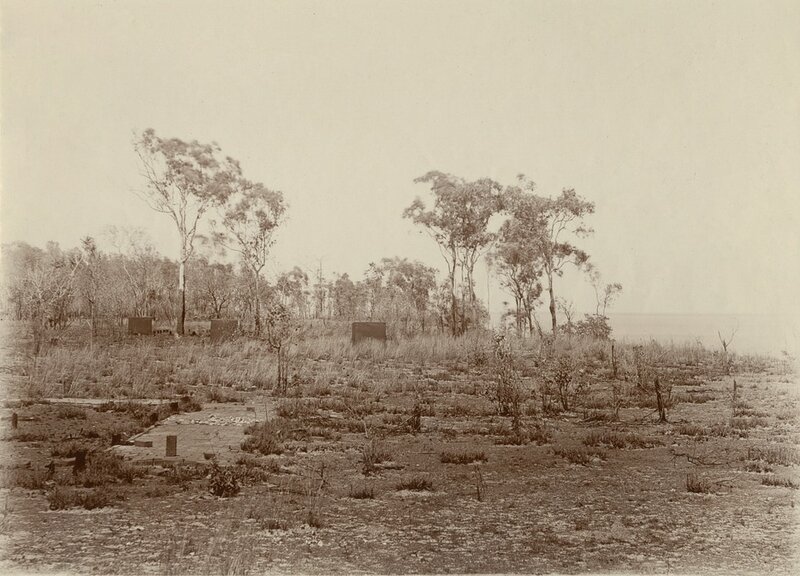 Such Sections of land in the vicinity of the town were made available as land grants to private individuals and Sections 45 and 390 were given respectively to Thomas Waterhouse of Adelaide on 12/10/1871 and to Florenz August Carl Bleeser, Assistant Postmaster, Darwin on 13/5/1919. 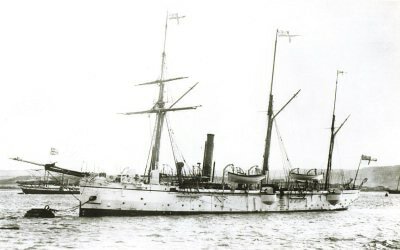 Dressing the ship in the RN is usually only done for visiting royalty - they might have so honoured Kitchener of Khartoum aboard HMS Encounter but that was 1910 - this is a composite gunboat possibly HMS Bramble which was with Owen Stanley and HMS Rattlesnake which rescued the Scot Barbara Thomson after being the sole survivor of the wreck of their cutter America & nearly 5 years as the wife of a tribesman called Boroto who called her Gi'om as he took her for the reincarnated spirit of his daughter but that was in 1849. 'During the stay of the Rattlesnake at Cape York a remarkable incident took place. On October 16, 1849, a white woman claimed the protection of a boat's crew who had landed on the beach. She was Barbara Thomson, a native of Aberdeen (Scotland), who had emigrated with her parents to New South Wales, where she had married. Some four and a half years previously (in 1845) she had embarked with her husband in the cutter America, bent on the salvage of oil from a whaler wrecked on Brampton Shoal. The guide, a member of the shipwrecked crew, failed to discover the wreck, whereupon recrimination and quarrelling ensued. Two men were accidentally drowned and a third was left on a small uninhabited island. 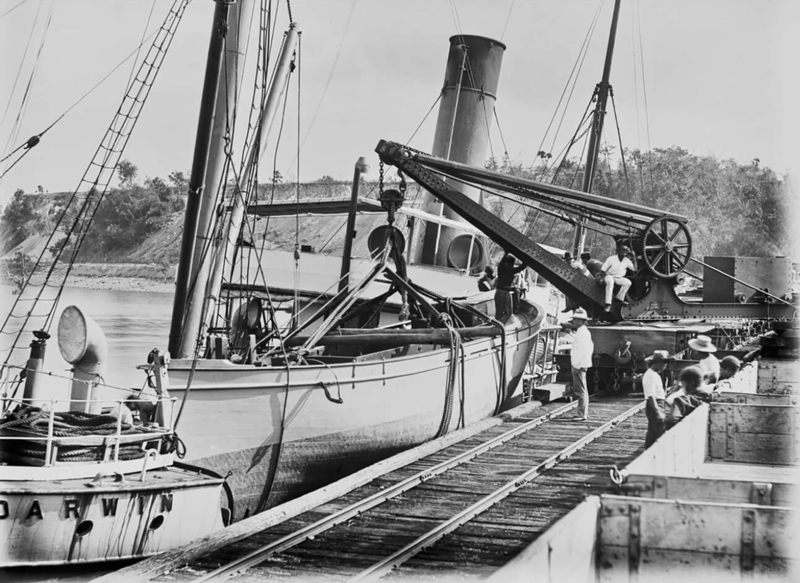 Then the America made for Torres Strait, and was wrecked on Entrance Island. ​The only two men then on the ship (one of them Barbara's husband) were drowned in the attempt to swim ashore; but the woman was rescued by the natives, one of whom, named Boroto, took her to wife, and she enjoyed the protection of a person of importance in the tribe, who lived on Prince of Wales Island and who recognised her as the re-embodied spirit of his deceased daughter who had been named Gi'om, which name was conferred on her. Unloading at Gulnare Jetty below Fort Hill inside Kitchener Bay with Stokes Hill to the right. Funnel is similar to the ship below which is unloading a boat that is the focus of interest. The funnel colouring may denote a shipping line with a dark top to increase draw. Perhaps they are waiting for the tide to drop then move the ship out to allow the boat to be lowered into the water - hence the air of 'those who 'also serve'. No record of a coastal vessel called the SS Port Darwin has yet come to light. 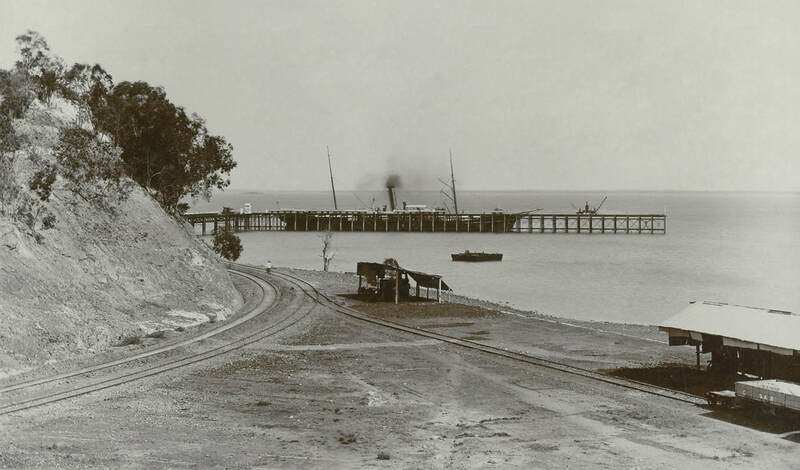 c1894 - SS Port Darwin unloading a lugger at the Railway Jetty with Stokes Hill in the background. NLA PIC-vn3797942-v The lugger Petrel D60 Japanese crew. 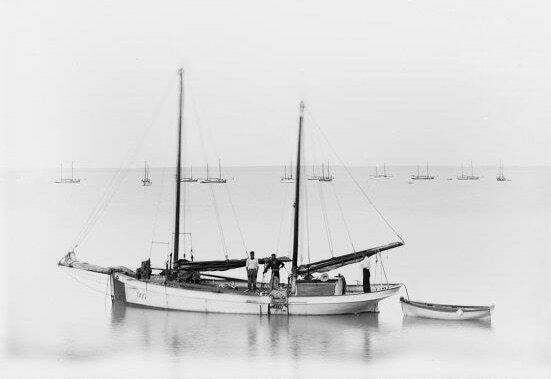 Lugger Ena struck a reef near Port Essington, NT, 11 April 1937. Crew of six rescued by the lugger Petrel. 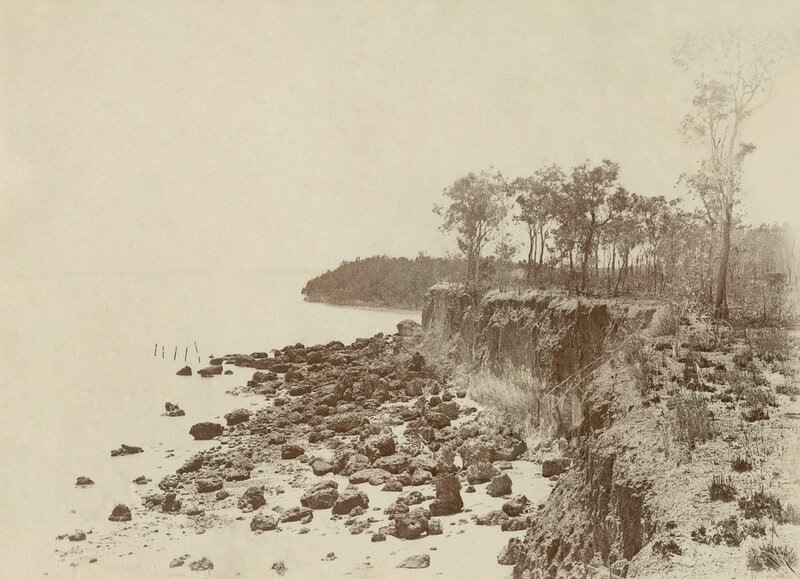 These Bleeser images show Palmerston (1864-1866) at Escape Cliffs in Adam Bay - at the mouth of the Adelaide River - South Australia's first attempt at a Capital for its Northern Territory and the promise of land sale revenue. 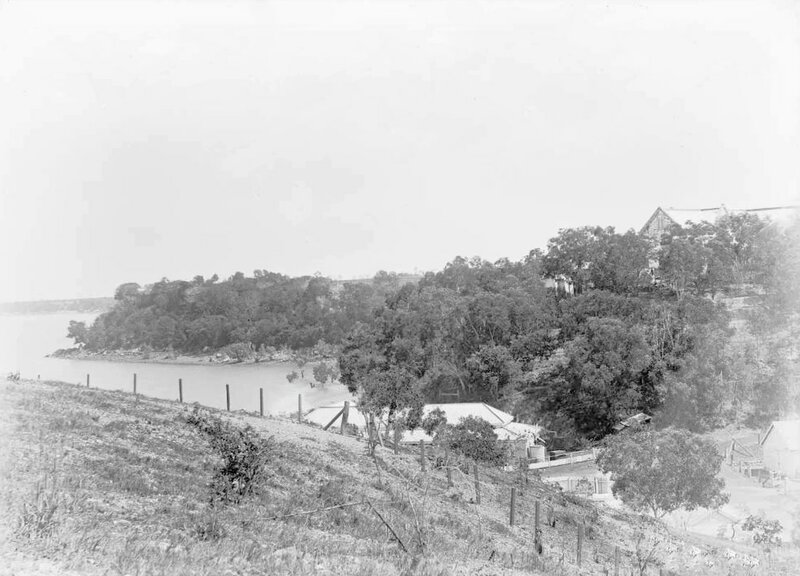 The image at left is another view of the same clump of trees except that it is taken from the other side of the water tanks.​ These unique images are indicative of the problem - decades out of copyright but owned & uncleaned copies sold by both the SLSA & NLA. It is a crime to disfigure images by puerile & idiotic notations for cataloguing purposes. These are SA/NT relics, as with all artefact management, they should be assembled as complete collections - researched, described, managed and conserved in the place where they have most meaning - by the people for whom they have most meaning and displayed for the self-esteem of that society - the education of its children and engagement of guests - not rendered useless & undiscoverable by institutions paid to do exactly the opposite. NLA PIC/9981/212 Bleeser c1890 - Knight's Folly on right with Residency above. The Folly aka Mud Hut corner appears to be fine dressed sandstone. Bleeser's photographic work is even more obscure than his botanical ​achievements but therein he is known for his images of Darwin either side of the great cyclone which began on the evening of the 6th January 1897, reaching crescendo between 3.30am and 4.30am on 7 January. 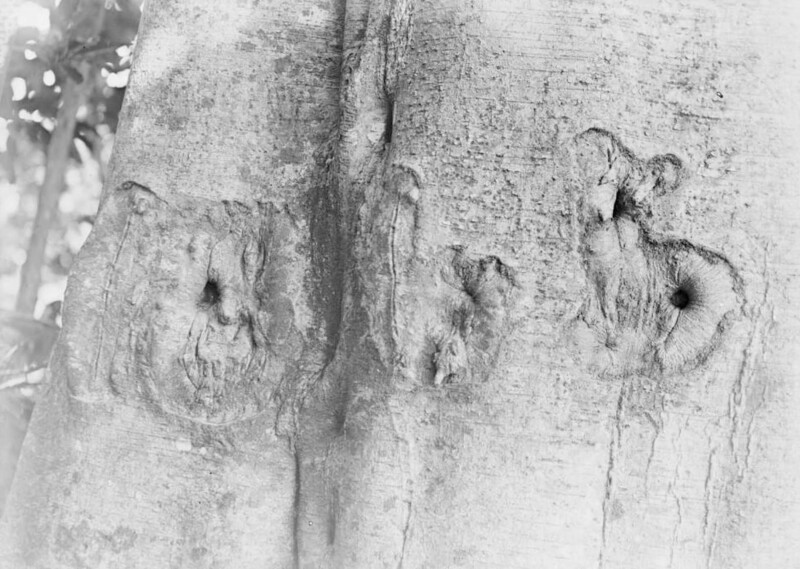 Bleeser was just 26 years old but he already displays a mastery of the technical and artistic challenges of photography in the remote tropics, as well as a fine appreciation of the medium's value as an analytical tool in the documentation of great events. NLA.obj-150838741 St Mary's Star of the Sea Roman Catholic Church.